If androids dream of electric sheep, then Plantoids dream of digital currency. The robot plant species, debuted at last month’s Ars Electronica festival by French artist group Okhaos, relies on bitcoin to stay alive and – once it has enough – even reproduce. How does it work? Just as bees pollinate crops, members of the public ‘feed’ the plant by sending funds to its bitcoin wallet. As the balance grows, its leaves unfurl one by one. Then, once it reaches its threshold – which varies from Plantoid to Plantoid – it will signal via “a display of colour and light” that it is ready to reproduce. Using smart contracts running on the Ethereum blockchain, it will commission a team of humans Okhaos has found – designers, artists, coders – to create its offspring. The project originated in a brainstorming session on ways to represent the blockchain in an artistic manner, one of Okhaos’ members, who wished to remain anonymous, told CoinDesk. “It soon became clear to me that using the notion of a ‘Plantoid’ to instantiate a self-owned and self-sufficient art piece was the perfect way to illustrate the potential of this emergent technology,” they added. The first Plantoid, which has so far received 0.01050490 BTC ($3.38) in online tips, is tucked away in Paris while a better location to display it is found. Ideally, Okhaos say, this should be a place that’s publicly accessible so the Plantoid can perform its function of providing beauty and collecting money. Artists earn a slice of each Plantoid’s tips and a cut from all of its future offspring (and their offspring, and so on) as a thank you for creating an attractive – and thus successful – specimen. While certain characteristics of the Plantoid are effectively ‘hard coded’ into each specimen’s DNA, for example the logic that dictates its growth and reproduction, others are open for artistic interpretation. “The rules underlying the reproduction [are] coordinated through the blockchain. In this way, individuals and groups are free to come and go according to the (autopoietic) laws of the work,” the group states. For example, active members of the plant’s DAO – its distributed governing team – can decide where it is exhibited or what it should look like. Further down the line, if smart contracts governing it are sophisticated enough, a Plantoid may even be able make decisions like which artists to hire of its own accord. Smart contract technology, a concept birthed by cryptographer Nick Szabo, has opened up the possibility of companies that can run without human control. On the Ethereum blockchain for example, a cluster of these self-executing contracts can create a rudimentary business (aka a DAO) that functions using the logic ‘if X, then Y’. Today, something that would have taken a group of people both time and legal costs to achieve can be executed with just a few lines of code. Here, the code itself forms an “incorruptible” rulebook, a new kind of law enshrined in cryptography. If this concept is taken to its extreme, DAOs will not just represent a group seeking to outsource labour into “computationally intractable tasks” but will be made for robots, by robots. These autonomous agents could be a network of public bikes that can pay for their own repairs or a robot artist collective capable of selling and distributing its work. There are still legal hurdles to overcome however. One day robots may be granted ‘legal personhood’ and the ability to own things like money and property, but for now that’s still a distant dream. This can be both beneficial to robot artists (see the bot who was released by police after ordering ecstasy online) and limiting (see the Legend of Zelda characters-turned artists – shown above – whose profits are hauled up in a trust fund until they have a way to spend their money). This Monday, Steven Tual, Ethereum’s CCO, confirmed in a company blog post that the platform’s code had now been ‘frozen’ for two weeks, with all technical features prepped. The launch of the Ethereum mining network (via a client called Geth) and the ability to execute contracts happened earlier today, following eight proof-of-concepts and a barrage of stress tests in the last release, Olympic. The formal launch had been pushed back multiple times. In essence, its a kind of pay-as-you-go supercomputer, with ether – computational power – the currency that brings these computerised functions to life. The more you need the supercomputer to do, the higher the fee. In the first tentative days of the platform – known as the ‘thawing phase’ – the supply of ether will be deliberately scaled back by 90% to 0.59 ETH per block, which are created roughly every 12 seconds. Technically, anyone with a GPU will be able to act as one of Ethereum’s mining nodes as it employs an ASIC-resistant scrypt mining algorithm to help prevent a single miner monopolising the network. However, should something go awry, the development team will still have ultimate control over the network, in the form of so-called ‘kill switches‘, or canary contracts. The glut of 2.0 platforms – such as Factom and Counterparty – often function by running abstratction layers on top of the bitcoin blockchain. However, Ethereum made the decision to create a purpose-built platform for these functions from scratch, building its own programming languages (Serpent, LLL and Mutan), comms system (Whisper), information management network (Swarm) and decentralised browser (Mist). Rudimentary versions of Ethereum smart contracts – one of the project’s principal selling points – are already available on the bitcoin network today to users of Counterpary, which made a point of porting this functionality from the project to its own in November. 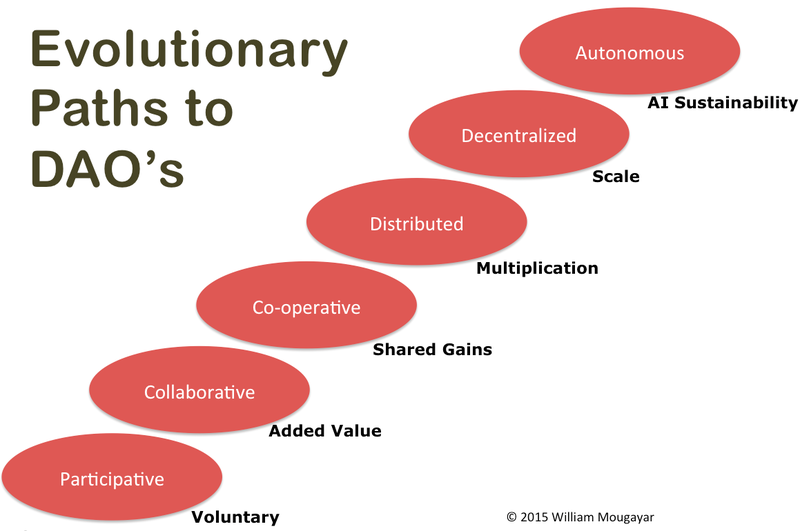 What Does it Take to Succeed as a Decentralized Autonomous Organization? William Mougayar is a Toronto-based angel investor and four-time entrepreneur who advises startups on strategy and marketing. Here, he discusses what makes a successful Decentralized Autonomous Organisation, or DAO for short. The concept of a Decentralized Autonomous Organization/ Corporation is an idealistic outcome of the crypto-tech revolution. Its roots originate in themes on organizational decentralization that were depicted by Ori Brafman in Starfish And The Spider (2007), and ones about ‘peer production’, aptly described by Yochai Benkler in The Wealth of Networks (2007). But these two themes were recently joined by the advent of cryptocurrency-related technologies by Dan Larimer who observed that Bitcoin is the original DAC, and Vitalik Buterin who expanded on that construct by generalizing it further as a DAO, noting that the DAO has “internal capital”. A few thought leaders and visionaries explained the theory and vision of DAOs/ DACs, but missing from the literature are real experiences and a deeper dive into the realities of operating a DAO. Certainly not all DAOs will be born by following a cookbook. And there will be variations and shades of purity in DAO principles, for practical purposes. So how do you get there, and what are the pieces of the puzzle from an operational/ practical view? Just because we can add crypto-tech doesn’t mean that the DAO will be successful. As a play on words, a DAO is DOA (dead on arrival) until the market starts to validate its assumptions. Although it is possible to aim for a DAO from day one of planning, it is also possible to evolve towards it, and it’s equally feasible to incorporate parts of a DAO construct into a traditional organization. Participative – users voluntarily and independently participate in loose tasks. Collaborative – users collaborate and add value towards common goals or objectives. Co-operative – users expects some shared gains to be returned. Distributed – starts the propagation of these functions by multiplying them across a wider net. Decentralized – further scalability is reached by instilling more powers to the edges. Autonomous – autonomous agents, smart programs, and (later) increased levels of artificial intelligence and AI algorithms will provide self-sustainability in operations and value creation at the centers, edges and arteries of an organization. In this post, I just wanted to lay out a framework for booting-up and operating a DAO, so there are no illusions about what it will take for be successful. My objective was to simply lay out the various pieces so you can think about them in a methodical manner, perhaps as an implementation guide or checklist that you gradually tackle. The users are at the center of this evolution, and so is the architectural backbone to support these user actions. Note that the participative/collaborative/cooperative functions are user-based, whereas the distributed/ decentralized/ autonomous ones are architecture-based. There are three ways to be involved in a DAO. You can buy shares/ cryptocurrency/ tokens, or they can be granted to you, or you can earn them. The earning part is interesting because it involves some work that is active or passive. An example of active working includes delivering on bounties for specific projects such as finding bugs, developing software, ethical hacking, or any task that is required by the DAO. Passive working is typically accomplished by sharing something, such as your computer processing cycles, Internet access, storage, or even your data. What you receive in return for your stake can also take many forms. Of course, the traditional instrument is a share (or a warrant/ option for shares), but value can also come in points, tokens, rewards or a cryptocurrency. Note that tokens could have multiple purposes, as they can represent product usage rights or ownership rights tied to some intrinsic value. Getting governance right is not easy, but it must be done. Autonomy doesn’t imply anarchy, so you’ll need to think about the various parts that make up governance, whether or not stakeholders are involved actively (e.g. voting, managing, creating rules, checking rules, decision-making, reporting, regulations), or passively (e.g. feeling empowered, valued, respected, fairly compensated). Regardless, transparency in governance must prevail. In the traditional sense, we’ve had profit sharing or dividend participation as a form of collective gain re-distribution. But in a DAO these benefits might include voting/ special rights, or being given a special status. Ultimately, there has to be value growth via internal capital appreciation in the form of cryptocurrency or cryptographically secure tokenization of some sort. The blockchain and cryptocurrency-based protocols and platforms are just enablers for the consensus mechanism. Typically, these are open source decentralized consensus and decentralized trust protocols that enable the irrefutability, verifiability and veracity of all transactions and smart programs. a) A user data layer, with an assumption that data is owned by the user, and only accessible in a specific aggregate or blind form by the DAO. b) Smart programs which are the actual transaction engines. c) Various API’s to interface with value-added services or partners that are ancillary to a DAO. Let there be no mistake that the key objective of a DAO is value creation or production, and to make that happen, there needs to be a specific linkage between user actions and the resulting effects of those actions on the overall value to the organization, as symbolized by the value of the cryptocurrency that is underlying it. That’s where entrepreneurial creativity needs to take place, and where business models will be concocted. Usage without value linkage is a waste and will result in a failure backlash. But there’s a warning here. Many of these DAOs will be theoretical in their inception stages. A pre-sale only enables the DAO to start on a path. At the end of the day, a new DAO is like a startup. It requires a product/ market fit, business model realization and a lot of users/ customers. Early on, a lot of assumptions are made, and the DAO may resemble science-fiction until the product/ service hits the market forces realities. The “proof of success” will be sustainability in the market, not the pre-sales success. I believe that getting to a DAO is a stepwise, gradual building block process that is made-up of several pieces. I think DAC/ DAO is a construct which will have degrees of purity in its implementation. There will be cases where only a % of a company is a DAC or operates like one. If you thought that spinning a DAO is a walk in the park, it won’t be. There will be different ways to skin a DAO. And there will be various ways to operate a DAO. This article originally appeared on Startup Management. It has been republished here with permission. Day two of The North American Bitcoin Conference (TNABC) was perhaps most notable for an absence of expected speakers, including Blockstream’s Adam Back, Bitstamp COO Jean-Baptiste Graftieaux and GAW Miners CEO Josh Garza, all of whom canceled scheduled appearances. However, the development may have been fitting given that the event succeeded at highlighting themes in the industry as opposed to any one individual, though security was the most visible topic of the day. A number of speeches and roundtables addressed security in both specific and abstract ways. The ongoing issue of how to make bitcoin more secure, whether that means boosting its struggling cloud mining sector, upgrading exchanges and wallets or developing a strategy for existential threats like regulation, seemed present in many sessions. Steven Sprague, whose security startup Rivetz presented at day one’s startup stage, articulated this point more specifically, touching on security with a nuance that is often lost in the mainstream media coverage of bitcoin. This emphasis was echoed by TNABC organizer Moe Levin, who told CoinDesk he believes the big question on display at the event was the ongoing battle between convenience and security. However, he suggested other topics might have suffered in light of this emphasis. “I don’t think enough time was given to how mass consumer adoption will happen this year,” said Levin. BitGo CEO Will O’Brien issued this statement early in the day’s proceedings in a talk that focused on his company’s multi-signature bitcoin wallet technology, as well as the larger struggles of the industry to provide users better security. O’Brien notably illustrated how he expects security to advance in the year ahead. His most direct prediction may have been that 2015 will see the industry adopt a ‘multi-institutional’ security standard that will see companies sharing the responsibility of holding and securing private keys. “By the end of this year, it will no longer be acceptable for one company to hold all the keys to a wallet,” O’Brien said. The statements could signal a trend given that 2014 was framed as the ‘year of multisig’ by many in the industry. Ethereum’s Vitalik Buterin was in attendance for a talk billed as being about the crypto 2.0 industry, though it was geared more specifically toward providing a high-level view of what makes decentralization valuable. Buterin naturally touched on the issues inherent with centralization, while framing bitcoin as just one of many already commonly used forms of decentralized technology, though on with real uses cases. For example, Buterin cited web link rot, whereby older outdate links die when the websites they link to are not longer maintained, as a pressing mainstream issue that could be solved by the community. “If all these websites were stored on a decentralized network, they would at least live forever or as long as somebody cared about them,” Buterin quipped. Buterin also outlined his five-layer overview of the crypto 2.0 space, a loose category he said for what has become a “convergence of different technologies”. Overall, his talk was able to articulate how these developing parts of the ecosystem intend to work together, even if the specific details have yet to be determined. Security was also top of mind during a mining panel that included BitFury CEO Valery Vavilov; Bitmain’s Yoshi Goto; Spondoolies-Tech CEO Guy Corem; Aquifer’s Anthony Brough; and developer Luke Dash. The panel was moderated by Tally Capital’s Matthew Roszak. Corem decried some cloud mining companies as “ticking bombs”, making clear that he thinks the issues in the industry are far from over. Vavilov, whose bitcoin mining company has raised $40m to date, positioned himself as the member of the group perhaps most willing to find solutions to the issue. “I may be an optimist, but I see the opportunity,” he said. Elsewhere, Bitmain’s Goto indicated that his company was exploring solutions that would help it provide a stable cloud mining product. Cloud mining companies aim to allow consumers a way to profit from bitcoin mining without the requirements of managing and operating the machines. Perhaps most notably, a much-anticipated Q&A with GAW Miners CEO Josh Garza did not take place as expected. The event, drummed up by bitcoin’s rabid Reddit supporters, had all the anticipation of a heavyweight bout. On the morning of today’s event, for instance, two of the top four posts were dedicated to deriding Garza and the paycoin project. Previously, Garza had agreed to participate in a session to be moderated by a member of the bitcoin community that addressed the controversies surrounding his company’s proposed bitcoin competitor, paycoin. The project recently became embroiled in scandal for actions related to the launch of paycoin, including the planned market support for the project. GAW Miners has notably launched a buyback program for the altcoin, which seeks to alleviate customer complaints. GAW Miners was a sponsor of this year’s TNABC. If some main speakers were noticeably absent, day two of the startup stage saw the surprise appearance of some companies not advertised on the TNABC schedule. This edition of the event featured distributed storage startup Stroj; bitcoin wallet Airbitz; blockchain rewards program Ribbit.me; decentralized prediction market Augur; Zimbabwe-based bitcoin ATM startup Crypto Counter; bitcoin wallet KrypotKit; and crypto 2.0 startup Tether. The panel of judges, including Roszak, Liberty.me’s Andrew Filipowski, Pantera Capital’s Steve Waterhouse and developer Peter Todd, was sometimes difficult on the startups, asking them pointed questions about their security and market strategy. One of the more well-received startups was Tether, which seeks to provide users a way to move fiat currencies on the bitcoin blockchain. However, it also showed the limits of decentralized technology in its current state, explaining that it still uses banks to account for fiat dollars. “Fiat goes into a bank account, it’s audited and the number of tethers in circulation will be audited by the blockchain,” CEO Reeve Collins said. Overall, the judges seemed split on the sum of the presentations, however. Roszak, however, was more positive, speaking in his remarks to the excitement that many still feel about the industry despite its recent struggles. “Love the energy, innovating on the blockchain, we need a lot more of this,” Roszak said. Ma’s comments come as part of a wide-ranging survey conducted by CoinDesk of the crypto 2.0 industry that sought to detail the hopes, fears and ideas that are defining what has become one of the bitcoin industry’s most exciting and controversial sectors. Swarm CEO Joel Dietz, whose company is grappling with many such concerns, echoed this belief, saying that the legal challenge for businesses like his own would be “massive” in 2015. When asked which arguments are likely to impact 2015, a common response was the fight over ‘bitcoin maximalism’, whether the bitcoin blockchain provides the best and most secure platform for the ecosystem’s continued experiments. Toronto-based co-working space Decentral has rebranded, dropping ‘bitcoin’ from its name and launching two new sites including a 24-hour bitcoin video news service. This will include the new Bloomberg-like information dashboard site Decentral TV, and a redesigned version of the original Decentral.ca site, which itself has a new focus on news updates and informational content. Co-founder Anthony Di Iorio told CoinDesk Decentral’s aim is to be “a home for decentralized and disruptive technologies”, whatever form they may take, providing quality and in-depth reports from its Spadina Avenue studio and around the world. The site will host multiple different video shows led by its flagship Decentral Talk Live show, a talk show-style program hosted by Di Iorio himself and partner Ethan Wilding, with a third rotating seat shared by up to 10 other hosts. Viewers will be able to call or write in and ask questions of the hosts. Other bitcoin video media producers will be invited to contribute too. The key, Di Iorio added, is quality. Interviews for the flagship show will be done in Decentral’s new studio and via Skype, featuring subjects from across the decentralized technology ecosystem. So far the team has done interview series with representatives from various bitcoin ATM companies, is currently working on one with exchanges, and plans another with wallet services. Di Iorio thinks there is enough material out there – whether it be news, reviews, or educational in nature – to supply about six hours of new content per day, which could then be repeated over a 24-hour period. As well as the video content, Decentral TV’s dashboard page features a selection of other news and information from the decentralized technology world: curated headlines from various daily news sources, price and mining data charts, and a ticker at the bottom of the screen showing price updates on the top 15 cryptocurrencies. Users can configure their preferred exchanges and local currency for bitcoin prices. A dropdown playlist shows a selection of available videos. As an incentive to viewers, Decentral TV will be running a ‘hidden brain wallet’ contest similar to the one used for its Rushwallet product, in which clues are hidden around the set for viewers to piece together. A total of 10 BTC will be up for grabs in the first two weeks. Decentral began life as a co-working space for bitcoin startups, but has since expanded to house decentralized technology projects of all kinds, most notably crypto 2.0 project Ethereum. Di Iorio said the organization is trademarking the ‘Decentral’ name in various jurisdictions with the goal of franchising its take on the co-working concept around the world. Teams working at the Toronto location have produced the Kryptokit and Rushwallet bitcoin browser solutions, and the organization also hosts an accelerator fund to support entrepreneurs developing the second generation of cryptocurrencies. Vitalik Buterin has beaten Facebook’s Mark Zuckerberg to win the World Technology Network (WTN) award for IT software. Buterin, the developer of crypto 2.0 platform Ethereum and co-founder of Bitcoin Magazine, received the honour at the WTN’s 2014 summit held at the Time & Life building in New York City. The event was organised in association with Fortune and Time. In addition to Ethereum, Buterin has been involved in a number of crypto projects over the years, including Dark Wallet and KryptoKit. This is not the first time the youthful developer has been rewarded for his efforts, earlier this year Buterin received a $100,000 fellowship from PayPal co-founder and venture capitalist Peter Thiel. Buterin was the only big name in the digital currency industry to win an award at this year’s WTN event. However, a number of familiar names from the world of finance and the tech industry also made it to the roster. Serial entrepreneur Elon Musk won two awards – one in the Energy category, as the chairman of SolarCity and co-founder of Tesla, and another in the Space category, as the founder of SpaceX. Paul Graham, Jessica Livingston, Robert Morris and Trevor Blackwell, the co-founders of Y Combinator, won individual awards in the Finance category. The Corporate Finance award went to 500 Startups. Both companies have previously invested in the bitcoin space. The World Technology Awards are an annual event with the aim of promoting outstanding innovators in a range of tech industries. Dozens of prominent industry leaders and companies have received World Technology Awards since the turn of the century, including the likes of Pinterest, Tesla, Skype, Apple, IBM, Amazon and many others – all organisations and individuals that have made their mark in in the world of technology.